When Israel started to bring in the approximately million Russians, many of whom are not Jewish (to say the least), people asked Saba what it was all about, and Saba reputedly answered that the Russians are big and make good soldiers, and in the future the U.S. would turn on Israel, and they would be scared because of the Russian soldiers. So it's interesting that a conservative radio host, Glenn Beck has recently began to suspect that the U.S. is up to no good. Just to clarify: personally I have almost no interest in predicting the future and trying to decide questions that aren't practical - I have a hard enough time dealing with real life decisions. 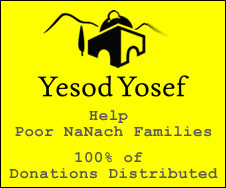 the reason why i posted this was because Saba supposedly said it and having bumped into that article I put the two together just to get people a little excited, and only because I thought that it can have a positive effect on people helping them realize that they can only rely on H"Y through Na Nach Nachma Nachman MeUman.